Within the framework of a 3 vinyl records box-set (Spectroscopic) produced by Vinyl on Demand (VOD110), which grouped his first 3 cassettes (Images, Element of Chance and Options), Ian Boddy has dug into his musical archives in order to find music written in the same time. And there was! From where comes “Other Rooms” that Ian Boddy put in the availability of his fans via the Bandcamp account of his label DiN. “Other Rooms” groups 4 tracks that were too long to be inserted into this box-set. 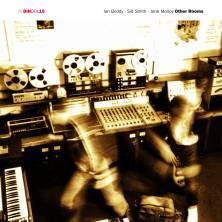 Tracks composed by Ian Boddy and his buddy of that time, Sid Smith, which are purely ambient, exploratory and experimental. And I like the title! It's very representative of an album which was extirpated of another dimension in Ian Boddy's universe. A dark and experimental universe where the sound experiences of the analog years gave some sound cocktails as stunning as puzzling and sometimes even strangely mesmerizing. The other rooms live in the Workshop studio in Newcastle-upon-Tyne at the very beginning of the 80's. It was in this place that Ian Boddy spent his years of training in the spheres of EM. It was also the time of sonic experiments where Boddy worked at both on the analog synths and on recording loops as well as sound effects. Musical elements which widened their droning veils in some kind acoustic echoes. And the outcome is an intense music of atmosphere which is the witness of the dark and black ambiences that have guided Ian Boddy's first works and the musical vestiges of which we still hear on his works in solos and with Mark Shreeve on Arc. There are a lot of things that can happen in the basement of imagination. And there is a lot during the 31 minutes of "The Basement". Loud knockings, like some heavy hits from poltergeist in hollow walls, resound in a sound painting to the textures of embryonic schizophrenia while that "The Basement" attacks our ears with an intense atmosphere of fright. The air is filled by a meshing of synth lines, nebulous layers and spectral waves which coordinate their obsessional frights. The knockings went silent but voices, hooting and whispers concealed in white noises eat away at our fear whereas the first pulsations draw a black rhythm at around the 7th minute. A rhythm which skips such as a huge gnome limping in a glaucous universe from where echo some explosions which slam like whip lashes in a sound whirlwind which reminds us that the doors of the alienation are never completely closed. This din of a magical apocalypse calms down little by little, letting these pulsations, became like the beatings of machines, get blurred in the squeaking of waves, that we can compare to those of Martenot, which roam such as sharp whistlings of ghosts. The 2nd phase of "The Basement" always remains so enigmatic with an abstruse mixture of serenity and terror where noises buzz of their plasmatic ringings in a nothingness adorned by tones as iconoclastic as serene. Disturbing and full of atmospheres. I imagine perfectly the effect in a black forest, especially with the breaths and the panting of the electronic beast, that "The Basement" can have on the control of inner fear. "Two Postcards" is the first of the two tracks written by Sid Smith, who plays bass and spreads his samplings of field recordings. The track borrows the same musical corridors as "The Basement", without the approach of visceral fright, with an ambient structure fed by experimental curiosities where Sid Smith lays down his samplings of a fast-growing society in search of a rural peace in a sound fauna filled by dense synth layers. Layers, sometimes black and sometimes shrill and also sometimes vaguely musical, which draw heavy ambiences by the gloom of caustic reverberations among which the acuteness breaths and eroded harmonies float and cover the snores of a bass more creative than living being. "From Where I Sit", again composed by Sid Smith, is a very penetrating track. The voice of Jane Molloy invades the space with hums, ahs and breaths mi-seraphic and mi-spectral which float and rolls in loops on tones coming out of a tape delay system. It's so much near the sources of the synths that I was trapped. It's a very enchanting track where the voice of Jane Molloy marries marvellously these oblong and floating tones which float and interlace such as iridescent spectres to shadows as much shrill as the threads of silver that one fiddles with the blade of handsaw. And these ghostly lamentations continue on the introduction of the very intense, but always ambient, "Spirits Rising" from which the strata which roll in loops are sounding like the big bells of church which tinkle in a sound nothingness painted of alarming streaks. Warmer breaths cross the confused spirits of the bell towers while that quietly "Spirits Rising"crosses its phases of serenity and dives back into its torments, spreading the net ambiguity of its paradoxes. “Other Rooms” is a work which address as much to the fans of sound experiments from Ian Boddy as those who like an experimental EM that the silversmiths of the analog art could sculpture from a simple breath. Anti music? Maybe! Except that the atmospheres which roam all over these long ambient sound paintings are simply near anxiety. They tear the ear, as the fear the stomach, testifying of an efficiency that the time was never able to tame.